Alzheimer’s is swiftly on the rise: it is estimated that every 67 seconds, someone develops the disease. For many, the words “Alzheimer’s disease” or “dementia” immediately denote severe mental loss and, perhaps, madness. 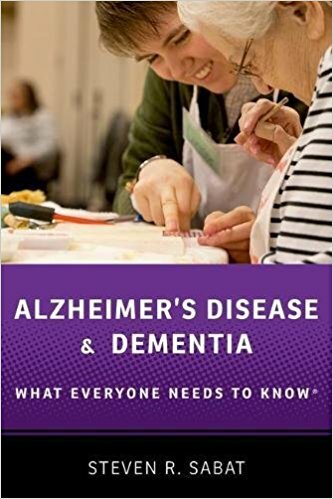 Indeed, the vast majority of media coverage of Alzheimer’s disease (AD) and other types of dementia focuses primarily on the losses experienced by people diagnosed and the terrible burden felt by care partners yearning for a “magic bullet” drug cure. Providing an accessible, question-and-answer-format primer on what touches so many lives, and yet so few of us understand, Alzheimer’s Disease and Dementia: What Everyone Needs to Know® contributes what is urgently missing from public knowledge: unsparing investigation of their causes and manifestations, and focus on the strengths possessed by people diagnosed. Steven R. Sabat mines a large body of research to convey the genetic and biological aspects of Alzheimer’s disease, its clinical history, and, most significantly, to reveal the subjective experience of those with Alzheimer’s or dementia. By clarifying the terms surrounding dementia and Alzheimer’s, which are two distinct conditions, Sabat corrects dangerous misconceptions that plague our understanding of memory dysfunction and many other significant abilities that people with AD and dementia possess even in the moderate to severe stages. People diagnosed with AD retain awareness, thinking ability, and sense of self; crucially, Sabat demonstrates that there are ways to facilitate communication even when the person with AD has great difficulty finding the words he or she wants to use. From years spent exploring and observing the points of view and experiences of people diagnosed, Sabat strives to inform as well as to remind readers of the respect and empathy owed to those diagnosed and living with dementia. Alzheimer’s Disease and Dementia conveys this type of information and more, which, when applied by family and professional caregivers, will help improve the quality of life of those diagnosed as well as of those who provide support and care.